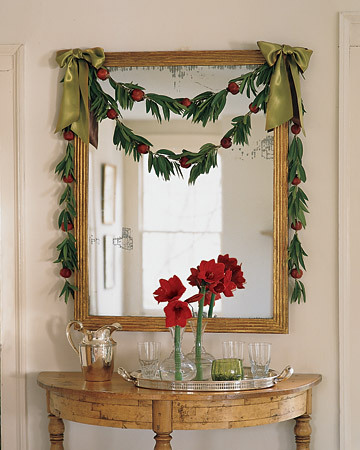 Ancient traditions survive: Martha Stewart's 1997 Bay Leaf and Pomegranate Garland recalls the importance of laurel leaves at the Winter Solstice, when Romans brought potted laurel trees into their houses. Image Source: Martha Stewart. Christmas is a holiday of palimpsests. Millennia of earlier festivals shine through opaque layers of tradition. The lighted evergreens, the feasts, the burning Yule logs, were part of pre-Christian eras. Benjamin Britten: Balulalow from A Ceremony of Carols (1942). St. Paul's Cathedral recording. Video Source: Youtube. Lyrics: James, John and Robert Wedderbum / Music: Benjamin Britten, from A Ceremony of Carols, Opus 28, 1942. Perhaps Christmas is actually supra-Christian. It celebrates the point at which the days become demonstrably longer after the Winter Solstice. See videos below and at the bottom of my post, "There is No Going Back," which explain that Christmas really marks the sun's changing relation to the Northern Hemisphere's winter constellations (videos are from Peter Joseph's 2007 film, Zeitgeist: The Movie). Excerpt from Zeitgeist: The Movie (2007), Part I. Video Source: Youtube. Excerpt from Zeitgeist: The Movie (2007), Part II. Video Source: Youtube. I don't agree with the Millennial conclusions Peter Joseph draws from his mythological and astrological critique of Christianity. He suggests that because so many older festivals are demonstrable antecedents for Christmas, Christianity itself is a hollow shell, an anthropomorphized parody of a sun god religion. That observation is academically interesting, but morally irrelevant. Although archaic astronomy, rituals, religion, myths and symbols can easily be deconstructed, and they all overlap at this time of year, they still retain their power for one reason. Christmas is a celebration of survival. This is why we feast with friends and family members. Gift-giving, even in the age of late capitalism, still signifies an effort to improve the lot of our fellow human beings, especially those we hold dear. It is a way of saying: you are still in the circle; you are not forgotten. An NYPD police officer bought a homeless man socks and winter boots on 14 November 2012. Image Source: Facebook. 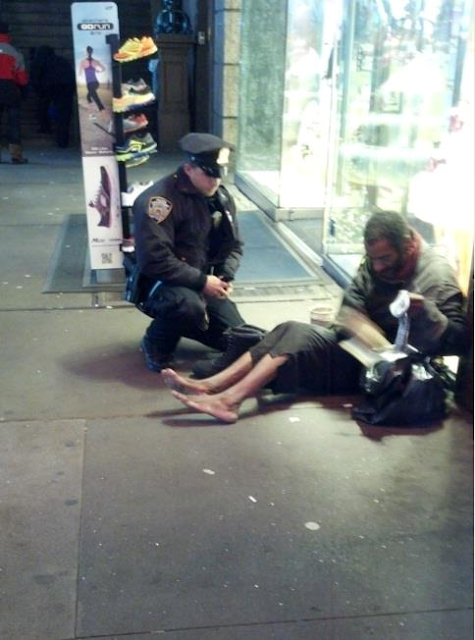 In November, an NYPD officer's gift of winter boots to a homeless man went viral. In other heartwarming stories, this year and last year, Secret Santas paid off customers' layaway balances at Walmarts in the US. This is why this solstice festival has endured since ancient times. It's not about commercialism; it is about survival. Christmas recalls the need to help one's fellow humans survive through the winter of the Northern Hemisphere. For many, basic survival is not an immediate concern. But the same concept of reaching out to others applies. Charity is about learning to think in a different way. If your perspective on the world's problems is fixed and obvious, you're missing something. Morality is an equalizer, a leveller, not a value which places anyone in a position to judge others. This holiday, please listen to someone with whom you vehemently disagree, rather than demonizing or dismissing them. Try to hear and understand their point of view, even if you think they are wrong, because everyone has a piece of the truth. It doesn't cost money: all it costs is time. In a global society, we are all in this together, and if one member of the community suffers, in the end, we will all suffer, sooner or later. Lovely post - have a wonderful holiday! Thanks Dia, Merry Christmas to you as well!